Tom Kha Gai... what can we say about this? It’s Thai, it is a soup (Tom) with chicken (Gai) and a lot of seasonings including galangal (kha) and can be found almost anywhere, much like French fries in Belgium. And it is made quickly. That is enough of a formal definition. 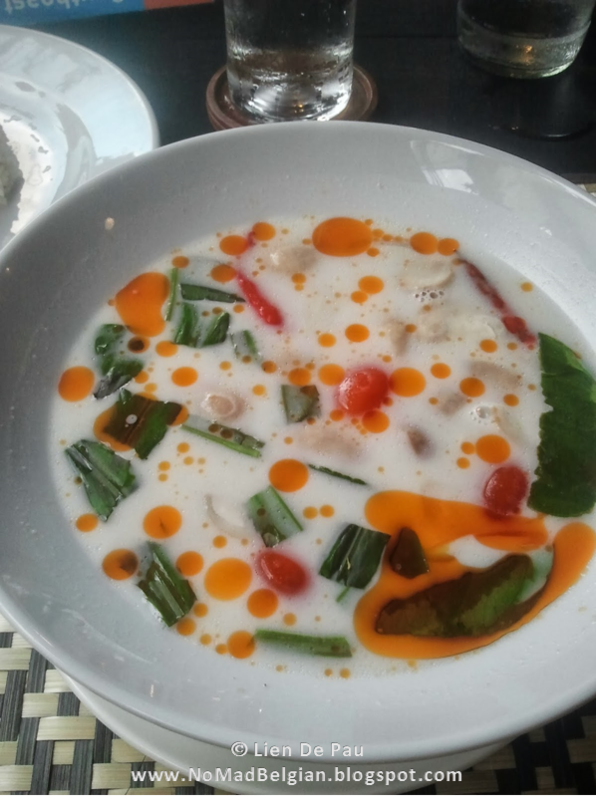 To me, Tom Kha Gai is like ‘an angel peeing on your tongue’, my meme description of all delicious edible or drinkable things! The taste of Tom Kha Gai is so layered, so diverse, so interesting that it just leaves you speechless. And when I was served this version in Chiang Mai I nearly fell off my chair. What an incredible presentation...! Make it and find true happiness! Chicken (75 gram per person), preferably fillet. Cut into bite-size pieces. galangal (3cm) (yes, it does resemble ginger but tastes more like aniseed. Personally I don’t think the two are interchangeable, so, head on over to the Asian supermarket). Heat up the coconut milk (not the cream) in a pot (keep it below the boiling point). Add all those blissful seasonings. It’s best not to chop the seasonings too finely because the eater must be able to taste them individually. Bruising is a good option. Allow to penetrate and taste. How delicious is that? If the soup is thick (for example, if the milk is thick), add some water or chicken broth. Add the mushrooms and shallots. Also add the chicken and simmer gently (do not boil as it makes the chicken tough). Taste. How delicious is that? You can also add some lime juice (if you want some acidity) and/or some palm sugar (dissolve well) (if you want some softness – which I can recommend). Add the coconut cream to give the soup a creamy texture. Serve in a bowl and garnish with coriander leaves.